Vegans eat no animal products, including eggs and dairy. Instead, vegans craft meals from fresh fruits and vegetables, tofu and other soy products, beans and legumes, grains, plant oils, nuts and seeds. While a balanced vegan diet is very healthy and appropriate for any person, regardless of age, it can be low in calories. A vegan diet can be high in calories if specific foods are emphasized. A high-calorie vegan diet includes large servings of carbohydrates, plant oils, beans, nuts and seeds, the most calorie-dense vegan foods. Eating every two to three hours helps you fit in a high amount of calories. At primary meals, include generous servings of healthy calorie-dense carbohydrate, such as brown rice, quinoa or whole-wheat bread and pasta, along with a serving of protein and heart-healthy fats. Snack often, choosing high-calorie foods, such as nuts, smoothies, dried fruits or granola. 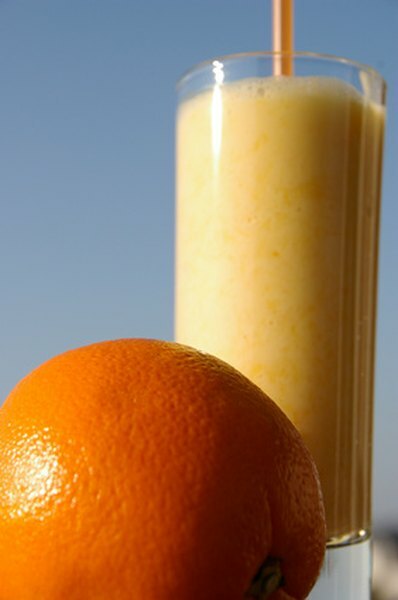 Vegan diets are sometimes deficient in vitamin B-12, calcium, zinc and omega-3 fatty acids, notes a February 2006 report in “The Proceedings of the Nutrition Society.” For calcium and extra calories, drink calcium-fortified orange juice or soy milk between meals. Fortified granola cereal is a high-calorie source of vitamin B-12. Including beans, legumes and grains helps you get enough zinc. High-calorie vegan sources of omega-3s include flaxseeds, chia seeds and walnuts. Boost your calorie intake by adding calorie-dense foods to your existing meals. Toss pasta in olive oil. Sprinkle walnuts, peanuts or sunflower seeds over salads. Add dried fruit and almonds to oatmeal. Blend flaxseed oil or meal and coconut into smoothies. Make soups with unsweetened soy or hemp milk. A meal plan that provides over 3,000 calories begins with 1 cup of cooked quinoa topped with1/4 cup raisins, 1 ounce toasted almonds, 1 tablespoon honey and 1 cup hemp milk. For lunch, have 2 cups of whole-wheat pasta tossed with 1 tablespoon olive oil, 1 cup white beans and sautéed kale. Dinner might include 6 ounces of firm tofu stir-fried with broccoli, soy sauce, 1 ounce cashews and served over 1 cup brown rice. Snack on a peanut butter and jelly sandwich, made with whole-grain bread, 2 tablespoons peanut butter and all-fruit spread, ½ cup of granola with soy milk and a smoothie made by blending a frozen banana with mango, flaxseed meal, almond butter and coconut water.